Located in Kailua-Kona, Four Seasons Resort Hualalai is by the ocean, within a 15-minute drive of Kekaha Kai State Park and Kua Bay. This 5-star resort is 10.7 mi (17.2 km) from Kaloko-Honokohau National Historical Park and 13.2 mi (21.3 km) from Waikoloa Beach Golf Course. Make yourself at home in one of the 243 air-conditioned rooms featuring refrigerators and MP3 docking stations. Your bed comes with down comforters and premium bedding. Rooms have private lanais. 42-inch flat-screen televisions with cable programming provide entertainment, while complimentary wireless Internet access keeps you connected. Private bathrooms with separate bathtubs and showers feature jetted bathtubs and designer toiletries. Relax at the full-service spa, where you can enjoy massages, body treatments, and facials. After practicing your swing on the golf course, you can dip into one of the 7 outdoor swimming pools. Additional amenities at this resort include complimentary wireless Internet access, concierge services, and babysitting/childcare (surcharge). Grab a bite to eat at one of the resort's 5 restaurants, or stay in and take advantage of the 24-hour room service. Snacks are also available at the coffee shop/café. Relax with your favorite drink at the bar/lounge or the swim-up bar. Full breakfasts are available daily from 6:30 AM to 11:00 AM for a fee. Featured amenities include a business center, limo/town car service, and complimentary newspapers in the lobby. Planning an event in Kailua-Kona? This resort has facilities measuring 28000 square feet (2601 square meters), including conference space. Free self parking is available onsite. Resting on the picturesque Kona-Kohala coast of Hawaii Island, the Four Seasons Resort Hualalai combines the warm aloha of the Islands with the signature service recognized by Four Seasons worldwide. With 243 guestrooms, an award-winning golf course, and 7 pools, this is a 5-star resort. Additional features include an Ocean Adventures team, 8 tennis courts, a spa with 14 treatment rooms and salon services, and a Cultural Center with classes and activities highlighting Hawaiian culture. The resort offers 5 dining options including 'ULU Ocean Grill + Sushi Lounge. Chefs in each dining outlet use ingredients from over 160 local farms and 75% of the food served is from Hawaii Island. The comfortable and spacious accommodations at the resort are housed in intimate 2-story bungalows arranged in small crescents along the beachfront and golf course. Beach Tree - The restaurant features vaulted ceilings and expansive ocean views, providing the ambiance of a Hawaiian beach house. California cuisine with an infusion of Italian is served for lunch and dinner. Al fresco dining is available and Hawaiian music is played nightly. 'ULU Ocean Grill + Sushi Lounge – Beachside ocean grill serving a selection of fresh island fish, meats and local Hawaiian produce. Dishes are oven-roasted, flame-grilled or wok-fired, showcasing simple, beautiful presentations. Extensive wine list. Exclusive dinners under the stars - For a romantic celebration perfect for a couple or an exclusive dinner perfect for 3-12 guests, breathtaking oceanfront dining settings include Kumukea Beach and Palm Grove Beach. Reservations are required. Hualalai Grille - American steakhouse with local flair, offering steakhouse classics like prime steaks, Kurobuta pork and local fish and chicken, with twists on traditional sides. Set above the 18th green of the famed Hualalai Golf Course, the restaurant evokes a contemporary club feel with ocean views. Beach Tree Bar - The beachfront bar is steps from the ocean and serves light fare along with tropical drinks. The 18-hole Jack Nicklaus signature Hualalai Golf Course is built on black-lava rock and winds over 7,100 yards beginning and ending at the ocean. A golf shop is located in the clubhouse and a driving range and golf instruction are available. 8 outdoor Rebound Ace tennis courts include 2 lighted for evening play. Complimentary tennis rackets and balls are provided. A tennis shop and tennis lessons are available. The 7 outdoor swimming pools spread across the resort include a quiet oceanfront heated pool and spa tub; an infinity-edge, lagoon-style beachfront family pool with a spa tub and separate freshwater children's pool; the adults-only Palm Grove pool in a garden setting with day beds, hammocks, and a spa tub; an Olympic-sized lap pool; a natural ocean pool carved out of lava rock; and an aquarium-style pond carved out of lava rock, which contains tropical fish. The Hualalai Sports Club includes a fitness studio with cardio and strength-training equipment and free weights and has a sauna, spa tub, and steam room. Fitness classes include aerobics, dance, spinning, swimming, yoga, and Pilates (surcharges apply) along with complimentary fitness walks, pick-up basketball, and volleyball. Certified trainers are on hand. Set in a lush garden setting, the Hualalai Spa offers indoor treatment rooms along with outdoor, secluded hales. Before treatments guests can relax in the open-air garden, spa tubs, saunas, steam rooms, and cold plunges. The spa offers a variety of massages, facials, and body scrubs using local natural ingredients. Wellness services include acupuncture, naturopathy, and nutritional consultation and salon services are offered. 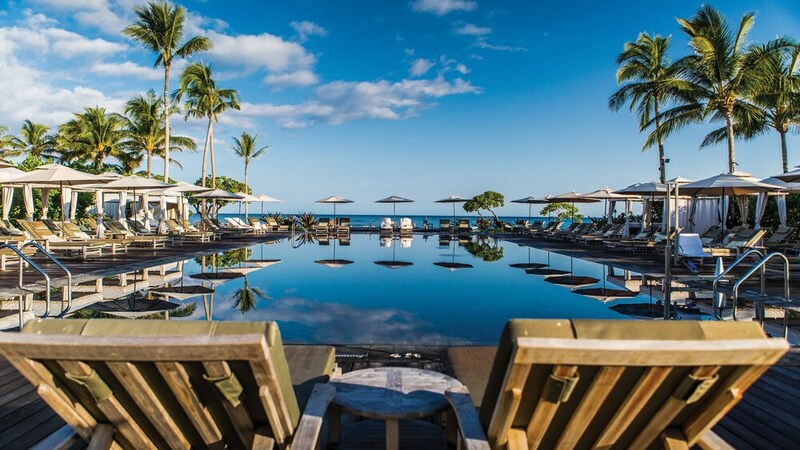 Four Seasons Resort Hualalai is listed in the 2015 Condé Nast Traveler Top 100 List.